ABOUT MOKUME GANE Briefly, the words “mokume gane”means metals with woodgrain. It is an ancient metal technique developed by a Japanese sword-smith. The process starts from cleaning and pressurizing many sheets of precious metals, than heat them to fuse to a billet. The billet should be forging & annealing again and again to make the bonding of layers strong. After that , we can carve, drill , roll or twist the billet to make the patterns revealed. Through the processes , we got amazing and unique patterns on it. Finally , flatten it to be the material of our jewelry. 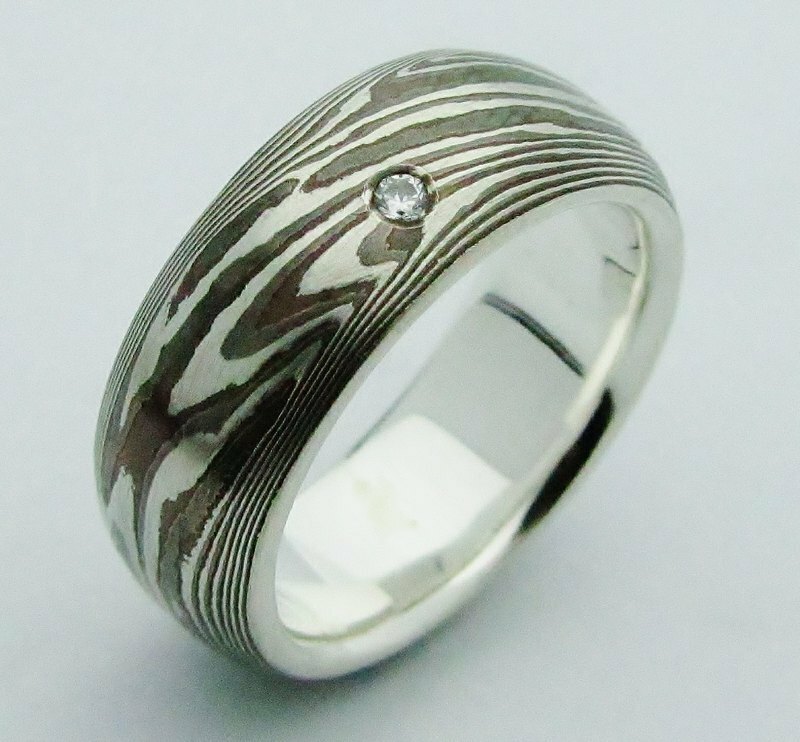 Materials：sterling silver (silver925)、copper、shibuichi (alloy：75Cu+25Ag) Ring width：8 mm Ring thickness：2.6 mm Pattern type：carve / drill / woodgrain Finish：brushed satin finish Etch or not： etched ( part of copper ) Stone：2mm CZ ◎ If you would like to engrave words inside the ring , please let me know. ^^ That may increase the cost about 20 USD per ring. ◎ Please allow 4~5 weeks to create your ring. ◎ Because of the nature of the Mokume Gane technique, the pattern on the ring will not be the same 100% but unique every time. ◎Please allow for some variation in color as displayed on different devices and screens. Actual colors may vary. ◎Ring size measuring： 1. Find your old ring, measure its diameter & tell me. ( e . g . diameter =19mm ) 2. The best way to confirm your ring size is to visit at least two reputable jewelers to have your finger sized. They should use standard fit sizers, and they should agree on what size you measured . 3. I can make different size of many countries , Please let me know what standard you take. ( e . g .： US size 9 1/4 = 19 mm ) ◎Delivery： This product will be shipped by regular air parcel. Delivery time is 4-5 weeks from time of payment. ◎Returns & exchanges： Custom orders are non-refundable, non-exchangeable. Client is responsible for providing Product sizing information and assumes all liability for any errors in Product sizing information. *Return policies of PINKOI：https://www.pinkoi.com/policy#~g ◎WITH YOUR ORDER, YOU WILL RECEIVE： A unique, custom made Mokume Gane ring A ring box to transport and store it in polish cloth ◎Maintain & Clean : 1. Please avoid wearing silver jewelry when taking a shower/bath, swimming, or using a spa or hot spring. 2. Avoid wearing jewelry when Lifting heavy objects 3.When silver becomes tarnished as a result of discoloration or oxidation, please use a silver cloth and wipe the jewelry in one direction. This should restore luster to the silver. 4. If silver jewelry becomes slightly yellow in color, you can clean it with a solution made of baking soda and water. Soak the silver in the solution. Then, gently clean the tarnish off with a soft toothbrush or sponge. Finally rinse the silver with clean water and wipe dry.